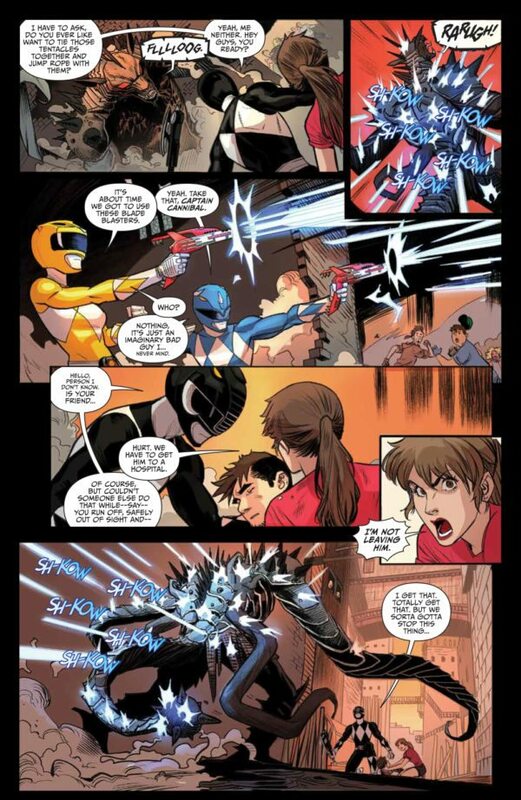 Go Go Power Rangers #4 opens with a flashback to what I’ll call the “Salad Girl scene.” It’s a story from Kimberly and Zack’s recent past that’s been referenced a bunch of times in the series. Until now, when a character would mention “Salad Girl,” I had no idea if I was missing a joke or a plot detail. So if this issue accomplishes nothing else, it at least solves the mystery of Salad Girl. 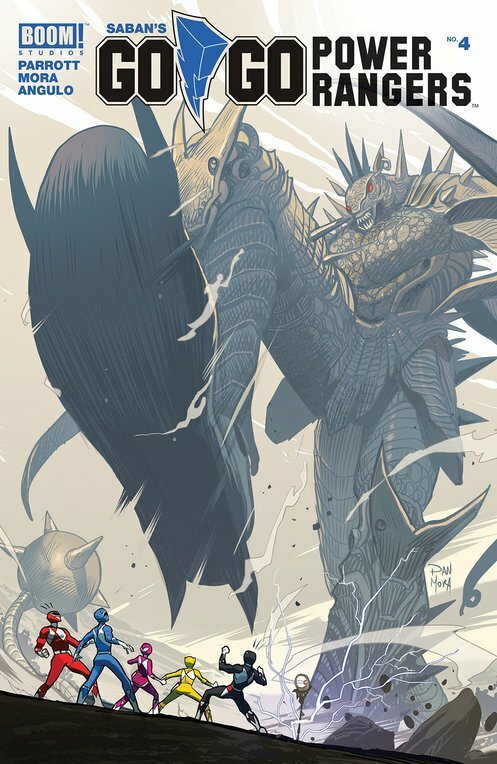 Thankfully, there’s more to Go Go Power Rangers #4, as the book wraps up its first arc, while still leaving a plot thread hanging for next time. As Rita begins her second attack on Angel Grove, Kimberly is in a tough spot. She must choose between saving her boyfriend Matt, and protecting the city at large as the Pink Ranger. Meanwhile, Jason is also on the sidelines for fear of being exposed as the Red Ranger. Our heroes once again have their backs against the wall! Dan Mora and colorist Raul Angulo have a very distinct energy they bring to the Power Rangers universe. Thus far, that’s been best exemplified in their sequences with the zords. They opened the series on a high note with their brief take on the climactic fight from “Day of the Dumpster.” They recapture that magic here, as we see the individual zords in action, followed by the Megazord. Mora somehow has a knack for drawing comic book style destruction on a grand scale. Part of it is that he’s awesome with action sequences (see the Jason/Trini sparring session from issue #2). But there’s something immensely satisfying about how these giant machines kick up debris when they’re summoned, or how the action lines wonderfully convey the speed and impact of certain blows. It also doesn’t hurt that this book has an almost regal take on the Megazord. One of the highlights of the issue is a splash page showing us the Megazord formation. Incidentally, Mora and Angulo also give us a terrific version of our resident school principal, Mr. Caplan (shown above). His shtick on the show was that he wore a toupee. I think we can safely say they nailed that one. On the writing front, things still look pretty good. Although late in the issue, we get a scene that seems to come out of nowhere. Zack shows up in the Command Center alone, and asks Zordon why he wasn’t chosen as team leader. He cites Jason’s absences from two recent conflicts, and in all fairness he does have a point given how early this is in their run as heroes. Parrott did plant a seed for this back in issue #2. But this still feels very sudden. Thankfully, Zordon gives him a good answer. She’s essentially saying it’s a numbers game. If you throw the dart enough times, you’re bound to hit the bull’s eye sooner or later. I’m not in love with this approach. It almost makes it seem like Rita is resigned to a certain amount of failure from the start. Given how short-tempered she always was on the show, it feels like a contradiction. I will, however, credit the book for trying to make some kind of sense out of it. At least if you separate the strategy from the character, it works. Nitpicks notwithstanding, we’re only four issues in, and I adore this series every bit as much as Mighty Morphin Power Rangers, if not more. Part of this book’s concept is that we get to spend a little more personal time with Jason and the others. It’s a strategy that’s paying off, and that isn’t a surprise. It’s been 25 years, but people still remember these characters, and the qualities the actors were able to inject them with. As it turns out, Ryan Parrott, Dan Mora, and the BOOM! Studios crew are bringing some pretty Morphenominal stuff to the table as well. This entry was posted in Comic Books/Graphic Novels and tagged Black Ranger, Blue Ranger, BOOM! Studios, comic book reviews, comic books, Dan Mora, Go Go Power Rangers, Go Go Power Rangers #4 (2017), Go Go Power Rangers (BOOM! Studios), Jason Lee Scott, Kimberly Hart, Megazord, Mighty Morphin Power Rangers, Pink Ranger, Power Rangers, Power Rangers comics, Raul Angulo, Red Ranger, Rita Repulsa, Rob Siebert, Ryan Parrott, superhero comics, teenage superheroes, Yellow Ranger, Zack Taylor, Zordon on 10/19/2017 by primaryignition.